OPERA MIRRORS ABORIGINAL CULTURAL PRACTICES. INDEED, INDIGENOUS AUSTRALIANS HAVE BEEN TELLING THEIR STORIES THROUGH SONG AND DANCE, DRAMA AND COSTUME, FOR THOUSANDS OF YEARS. THE COMPARISON TO OPERA IS OBVIOUS AND YET FOR SO LONG WE HAVE BEEN UNDER REPRESENTED IN THIS WONDERFUL GENRE. In July 2006, Pecan Summer was little more than a title. Ten years on from my autobiographical play White Baptist Abba Fan I knew it was time for my next major theatrical effort but what was it to be? After almost 20 years as a freelance soprano, I felt it was time to do something to encourage other Indigenous singers to consider a career in classical vocal music. Opera has been my life; I have immersed myself in that world since the age of 14. I cannot imagine a world without it. The power of music to elevate a story beyond the spoken word has always captivated me. Harold Blair paved the way for me. 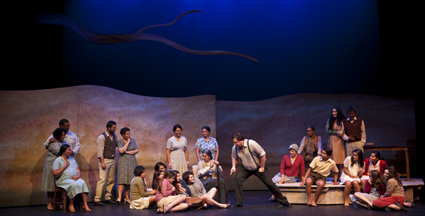 In 1949, a 25-year old Aboriginal tenor emerged from the cane fields of Queensland. After gaining his diploma at Melba Conservatorium, he began a career that was to span almost 30 years. Harold was the first. It is never easy to be the first. He was a leader at a time when Australia wasn’t sure what to do with Aboriginal leadership. But with his voice and professionalism he well and truly transcended the status of Flora and Fauna imposed on Aboriginal people prior to 1967. Developing a career in opera is a long, slow process. It is an elite pursuit. It is a demanding and all consuming profession with many, many layers of knowledge to acquire before a career can begin in a meaningful way. These points are NOT reason enough to prevent Indigenous men and women from taking this path, but the weight of low expectations could be. It is my goal to change expectations. When you change expectations you change outcomes. In April 2007, after receiving an Australia Council Fellowship, I began a process researching the history behind Pecan Summer. I chose the story of the 1939 walk off from Cummeragunja NSW Mission/Station for its obvious dramatic content, the exodus of Yorta Yorta people from their homeland and the inevitable and unending search for identity. Much of my early research took place in the library of the Koorie Heritage Trust in Melbourne. I soon realised I needed to go to the source and speak to people who had lived the experience and most of whom are now in their late 70s. I headed north to Shepparton where I knew of a Yorta Yorta Elder who had experienced the walk-off. Aunty Frances Mathyssen was just nine years old when she left Cummera along with her parents and 200 other men, women and children and yet could recount the events of that day in such vivid detail that I was immediately transported to that hot February morning. In 1939 the men and women of Cummera took their destiny into their own hands. Leaders such as Bill Onus, Jack Patten and Geraldine Briggs, encouraged by the tireless efforts of William Cooper and Douglas Nichols, showed amazing courage to lead their people across the Dhungala (Murray River) into Victoria. It is an epic tale. One deserving of an opera. It also became a personal story. During my conversations with Aunty Frances I made a startling discovery. The Aboriginal grandparents that I had never known were actually part of the story and were well known to the elderly people I was interviewing. Suddenly I had a family that stretched beyond the limitations of my knowledge. People were telling me how much I reminded them of my grandmother Francis and how she was a singer with a beautiful voice. Suddenly my past linked up with my present and my future, and I just happened to be writing an opera about it—what are the chances? Pecan Summer is my first libretto, my first operatic score. It comes from a very deep place, from genetic memory, from life’s experiences. In 2010 we took the story home, to Mooroopna, near Shepparton, for the world premiere. We did this in honour of the men and women whose lives were shaped by the walk-off. In 2011 it had its Melbourne premiere in the iconic Arts Centre Playhouse. Both seasons were received with critical acclaim. In 2012 we shared our story with Western Australian audiences, on the ancient land of the Noongar people. Like Harold Blair before me, I set out to create a pathway for Indigenous singers who wish to pursue a career in the intensely emotional world of classical vocal music. 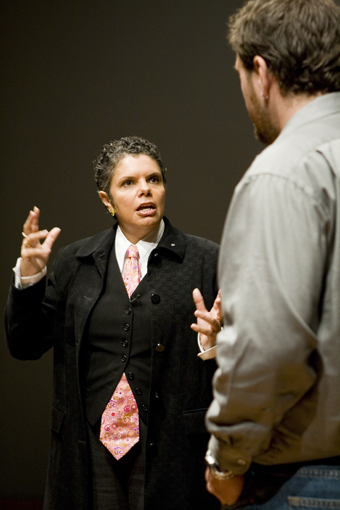 Australian Indigenous voices can and will become the new sound in opera around the world. With Short Black Opera developing artists the calibre of Yorta Yorta bass baritone Tiriki Onus and Wiradjuri soprano Shauntai Batzke the future is looking very bright.